This dish uses both the seeds and leaves of the weed. “Popped amaranth tastes like popcorn but is quinoa-sized,” says Brooklyn-based recipe developer Ali Slagle. 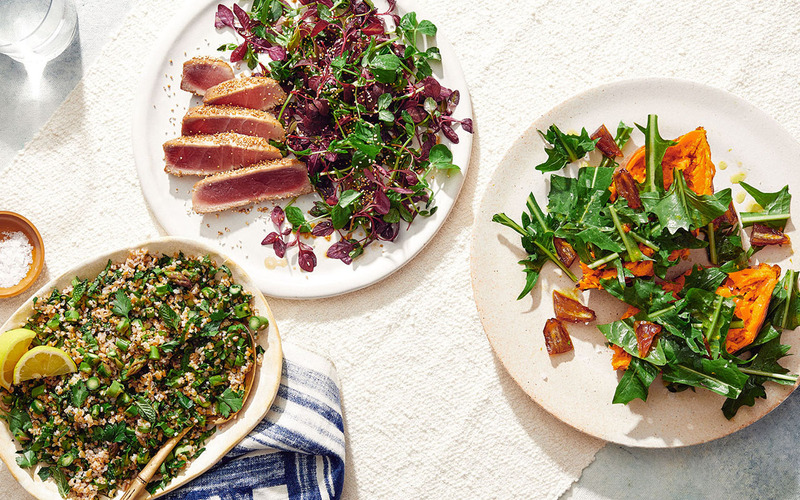 In this recipe, which features protein-rich tuna, Slagle coats the outside of the fish with amaranth grains, which are gluten-free and full of fiber. She also uses the weed’s leaves, which come in red or green hues, as a salad on the side. If you can’t find amaranth greens, swap in pea shoots, mizuna, watercress, or microgreens. Use whichever citrus juice you prefer for the dressing. In a small bowl, combine the citrus juice, soy sauce, rice vinegar, and sesame oil. Pat the tuna dry with a paper towel, then season both sides with salt and pepper. Spoon or brush some of the citrus-soy sauce over both sides of the tuna and set aside to marinate. Reserve remaining sauce for dressing the greens. Heat a medium skillet over high heat. Add the amaranth grain and cover the bottom of the pan, shaking, until mostly all seeds are popped, about 20 seconds. Transfer to a rimmed plate or shallow bowl. Wipe out the skillet, then heat the oil over medium-high. Add the tuna and cook for one minute per side, until seared on the outside but still raw in the middle (if you prefer it less rare, continue cooking to your desired doneness.) Transfer the tuna to the plate with the popped amaranth and flip to coat both sides of the fish. In a medium bowl, toss the greens with enough of the citrus-soy sauce to lightly coat (you may not use it all). Thinly slice the tuna and serve with salad alongside. If there is any remaining popped amaranth that didn’t stick to the tuna, sprinkle it over the salad.